OSHA On-Site is the consultation component of OSHA, whose main goal is to assist employers in maintaining compliance on jobsites. In some instances, OSHA On-Site can recommend inspections from the enforcement division of OSHA. At the request of an employer on the Beacon Project in Cleveland OSHA On-Site was invited to inspect work. Upon seeing OCP employees fireproofing, OSHA On-Site focused a great deal of attention to this process. 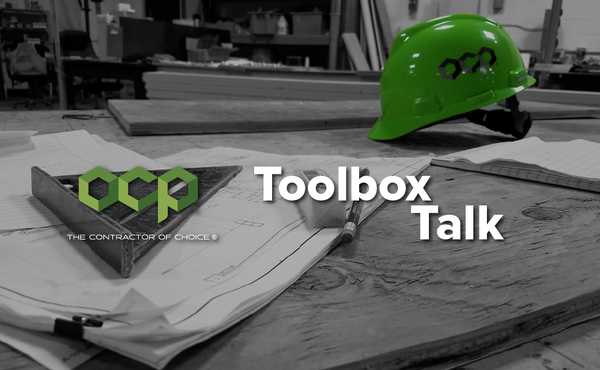 Due to the fact that OSHA representatives often come to the jobsite unannounced, OCP field employees on the Beacon jobsite were unaware that they were being interviewed by the OSHA On-Site team when questioned about the fireproofing process. The OSHA On-Site representative made it a point to speak to me to state one very important thing, that she “felt the excellence of OCP’s safety program” from the unannounced interview she conducted. In the interview OSHA focused questions on the silica present in the product, and were impressed to learn employees knew the testing data surrounding the product. Further, employees stated that the level of silica present was below the action level and that respirators were optional for the installation. The representative was impressed with overall knowledge, confidence in the knowledge, and appropriate use of respirators. I would like to personally thank the fireproofing crew at the Beacon project for their professionalism and for showing the strength of the OCP safety program through their actions and knowledge. OCP has done a magnitude of air testing for silica for many different task. OCP has not found any task to be over the action level for silica, at or above 25 micrograms per cubic meter. You may view all these task in OCP’s Silica program. All by now should have been through the silica awareness training. If you have questions about the product you are installing or need to get silica awareness training please contact your local Safety Director. Their contact information can be found below.